'Prepare to weep - I defy anyone to read this and not have a tear in their eye.' reviewer, 5 stars "Anyone who wishes David Nicholls would write faster needs to grab this with both hands." Jill MansellAn emotional page-turner with a heart-pounding dilemma. 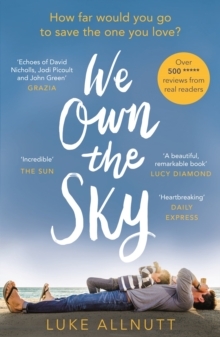 Fans of Jodi Picoult, David Nicholls and Jojo Moyes will love We Own The Sky. Anna and Rob were the perfect couple with their whole lives in front of them. When beautiful baby boy Jack came along, their world seemed complete. But when tragedy strikes they are faced with an impossible choice. They have one chance to save their child, but at what cost? "...a touching narrative of first love and fatherhood" The Sunday Times****Praise for We Own The Sky'A beautiful, hugely emotional story.' - The Sun'A heartbreaking read about love and loss.' - Bella Magazine'Prepare to have your heart wrenched by this emotion-drenched story.' - Sunday Mirror'This tender depiction of a father's love for his son is utterly heartbreaking and will stay with you long after the book has finished.' - The Express'Deeply affecting. A beautiful, remarkable book.' - Lucy Diamond, author of The Secrets of HappinessUtterly beautiful, heartbreaking and ultimately uplifting. - Rachael Lucas, author of The State of GraceWhat an incredible book this is - such gut-wrenching honesty and depth of emotion. Anyone who wishes David Nicholls would write faster needs to grab this with both hands. It's a truly stunning achievement. 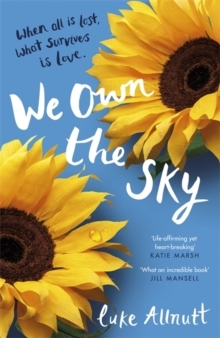 - Jill MansellBeautifully rendered and profoundly moving, We Own the Sky illustrates the lengths we'll go to for those we love. Luke Allnutt is a major new talent in fiction and his debut is not to be missed. - Camille Pagan, bestselling author of Life and Other Near-Death Experiences*****What readers are saying about We Own The Sky:Emotional and moving. - 5* review, AmazonThis is a truly beautiful story told from the heart and written with such great feeling. - 5* review, AmazonI loved this book for its honesty, it's rawness and for its abundance of pure love. It made me laugh, it made me cry, and it will, I know, stay with me for a very long time. - 5* review, AmazonWe Own The Sky by Luke Allnutt is a story about despair and fear, but it is also sprinkled throughout with hope and love - the love one has for their child and how far you would go for them.